τα νεα του τενις: Εχουμε μνήμη κ Πρόεδρε!!!!!!!!!!! «Ο Πρόεδρος του Δ.Σ. της ΕΦΟΑ Σπύρος Ζαννιάς, επικοινώνησε με τον πατέρα του αθλητή Απόστολο Τσιτσιπά και έδωσε, εκ μέρους του Δ.Σ. και Ολόκληρης της Οικογένειας του Ελληνικού Τέννις, τα θερμά συγχαρητήρια για την επιτυχία του Στέφανου. Why shouldn’t he believe? After all, things are moving fast for the 18-year-old prospect from Athens and he was feeling on a high after an emphatic second-round win in qualifying, 6-3 6-3, over the well-supported home player Gleb Sakharov, which moves him just one match away from his first taste of main-draw action in a Grand Slam. If Tsitsipas can next overcome German Oscar Otte, it would be entirely in keeping with his inexorable progression from world junior No.1 to becoming one of the most talked-about tyros on the circuit with a thoroughly modern game based on aggression and power but laced with a delicate touch and a lovely one-handed backhand. Only a couple of weeks ago, the lad ranked 202nd in the world turned over the talented Czech world No. 56 Jiri Vesely. “I felt that fire inside of me when I played him,” he told rolandgarros.com. It’s a burning sensation that he’s evidently feeling increasingly. With the sun blazing down on him and a bunch of kids clamouring around him for autographs outside Court 14 after his 70-minute defeat of Sakharov, you could not help but think that here was a youngster who seemed perfectly at home with all the fuss that comes with being one of the circuit’s next big things. “Many people do expect a lot of things from you after you’ve been the No.1 junior,” mused the teenager who follows the illustrious likes of Gael Monfils, Marin Cilic, Nick Kyrgios and, most recently, Alexander Zverev, in holding that title since the ITF introduced its combined junior ranking system in 2004. “I wouldn’t say I feel a lot of pressure because of that. I know that I got to the No.1 in juniors, but the professionals is more important for me now and I have to keep focussed and keep going the way I am right now. What is most impressive about Tsitsipas, who’s already the Greek No.1, is that he is so evidently doing all the right things to make it to the top. He talked about his hard training and working on his fitness this week with a new physical trainer who once worked with Serena Williams. Having tennis in the blood helps too, he added, talking of his father Apostolos, who as a qualified coach has been his chief mentor, and Russian mum, Julija Apostoli, who once made the top 200 on the WTA tour, a feat her son emulated in January on the men’s tour. “I see it as something positive that a person from your family played professionally – she’s very supporting and as a son, I love her,” said the man known as ‘Stef’ who started playing under his parents’ watch as a three-year-old when they were coaching at a summer resort in Greece. 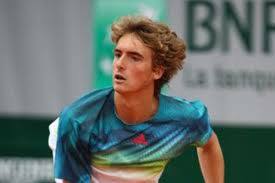 These days, after having achieved his first Grand Slam success by winning the boys’ doubles in 2016 at Wimbledon with Estonian Kenneth Raisma, Tsitsipas finds himself spending more time at his base in Nice at the Mouratoglou Academy than in Athens, where he hopes his progress is inspiring other young players. As have been his practice sessions up with the best players in the world. “It helps to play with the top 10 players. I think I’ve practised with them all except Federer and Nadal. You never know,» he laughed. If he could stop the nerves from jangling and win his third-round qualifying match, maybe Nadal could be on the agenda – as an opponent – in the main draw. And if that fire is burning inside him again, here’s a potential new Greek hero who’s beginning to think anything is possible. Διαβάζοντας μια συνέντευξη 18 χρόνια μετά.